Earlier today, Microsoft hosted a customer event in San Francisco where I joined CEO Satya Nadella and COO Kevin Turner to share our perspective on the role of data in business. Satya outlined his vision of a platform built for an era of ambient intelligence. He also stressed the importance of a “data culture” that encourages curiosity, action and experimentation – one that is supported by technology solutions that put data within reach of everyone and every organization. Kevin shared how customers like Beth Israel Deaconess Medical Center, Condé Nast, Edgenet, KUKA systems, NASDAQ, telent, Virginia Tech and Xerox are putting Microsoft’s platform to work and driving real business results. He highlighted an IDC study on the tremendous opportunity for organizations to realize an additional $1.6 trillion dividend over the next four years by taking a comprehensive approach to data. According to the research, businesses that pull together multiple data sources, use new types of analytics tools and push insights to more people across their organizations at the right time, stand to dramatically increase their top-line revenues, cut costs and improve productivity. In my keynote, I talked about the platform required to achieve the data culture and realize the returns on the data dividend – a platform for data, analytics and people. It’s people asking questions about data that’s the starting point — Power BI for Office 365 and Excel’s business intelligence features helps get them there. Data is key – data from all kinds of sources, including SQL Server, Azure and accessibility of the world’s data from Excel. Analytics brings order and sets up insights from broad data – analytics from SQL Server and Power BI for Office 365, and Azure HDInsight for running Hadoop in the cloud. A platform that solves for people, data, and analytics accelerates with in-memory. We created the platform as customers are increasingly needing the technology to scale with big data, and accelerate their insights at the speed of modern business. Having in-memory across the whole data platform creates speed that is revolutionary on its own, and with SQL Server we built it into the product that customers already know and have widely deployed. At the event we celebrated the launch of SQL Server 2014. With this version we now have in-memory capabilities across all data workloads delivering breakthrough performance for applications in throughput and latency. Our relational database in SQL Server has been handling data warehouse workloads in the terabytes to petabyte scale using in-memory columnar data management. With the release of SQL Server 2014, we have added in-memory Online Transaction Processing. In-memory technology has been allowing users to manipulate millions of records at the speed of thought, and scaling analytics solutions to billions of records in SQL Server Analysis Services. 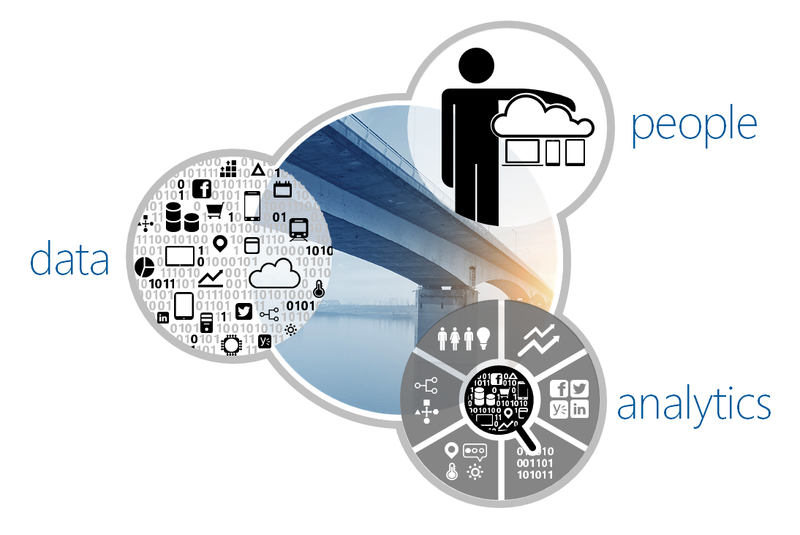 The platform for people, data and analytics needs to be where the data and the people are. Our on-premises and cloud solutions provide endpoints for a continuum of how the realities of business manage data and experiences – making hybrid a part of every customer’s capability. Today we announced that our Analytics Platform System is generally available – this is the evolution of the Parallel Data Warehouse product that now supports the ability to query across the traditional relational data warehouse and data stored in a Hadoop region – either in the appliance or in a separate Hadoop cluster. SQL Server has seamless integration with VMs in Azure to provide secondaries for high availability and disaster recovery. The data people access in the business intelligence experience comes through Excel from their own data and partner data – and Power BI provides accessibility to wherever the data resides. The platform for people, data and analytics needs to have full reach. The natural language search query Q&A feature in Power BI for Office 365 is significant in that it provides data insights to anyone that is curious enough to ask a question. We have changed who is able to reach insights by not demanding that everyone learn the vernacular of schemas and chart types. With SQL Server, the most widely-deployed database on the planet, we have many people who already have the skills to take advantage of all the capabilities of the platform. With a billion people who know how to use Excel, people have the skills to get engaged on the data. Looking forward, we will be very busy. Satya mentioned some work we are doing in the Machine Learning space and today we also announced a preview of Intelligent Systems Service – just a couple of the things we are working to deliver a platform for the era of ambient intelligence. The Machine Learning work originates in what it takes to run services at Microsoft like Bing. We had to transform ML from a deep vertical domain into an engineering capability, and in doing so learned what it would take to democratize ML for our customers. Stay tuned. The Internet of Things (IoT) space is very clearly one of the most important trends in data today. Not only do we envision the data from IoT solutions being well served by the data platform, but we need to ensure the end-to-end solution can be realized by any customer. To that end, Intelligent Systems Service (ISS) is an Internet of Things offering built on Azure, which makes it easier to securely connect, manage, capture and transform machine-generated data regardless of the operating system platform. It takes a data platform built for the era of ambient intelligence with data, analytics and people to let companies get the most value from their data and realize a data culture. I believe Microsoft is uniquely positioned to provide this platform – through the speed of in-memory, our cloud and our reach. Built on the world’s most widely-deployed database, connected to the cloud through Azure, delivering insights to billions through Office and understanding the world through our new IoT service – it is truly a data platform for a new era. When you put it all together only Microsoft is bringing that comprehensive a platform and that much value to our customers.